It was late Sunday night when Son # 2 casually mentions that he needs The Catcher in the Rye for the next day’s English class. Usually such a late night pronouncement would produce lots of grumbles, mumbles, and late night (or very early the next morning) runs to the closest store. Not this time, however. My husband simply walked into the den, eyed the top shelf of the book case, and pulled the needed book, and handed it to our son. That shelf, in particular, holds many old classics. Most of the books are mine or my husband’s from when we were in high school. Books like The Grapes of Wrath, The Great Gatsby, To Kill a Mockingbird (among others). A lot of them are tattered and dog-eared and stuffed with notes taken in a long ago English class. They’re part of our history, and it’s really very neat to share that with our kids. And also, for our kids to add to the shelves. My daughter had to read Rebecca for summer reading last year. And though the cover had been updated for a younger generation, the book itself will always be a classic. It hasn’t made its way from her room to the “classics” shelf yet, but I have a feeling it’s just a matter of time. 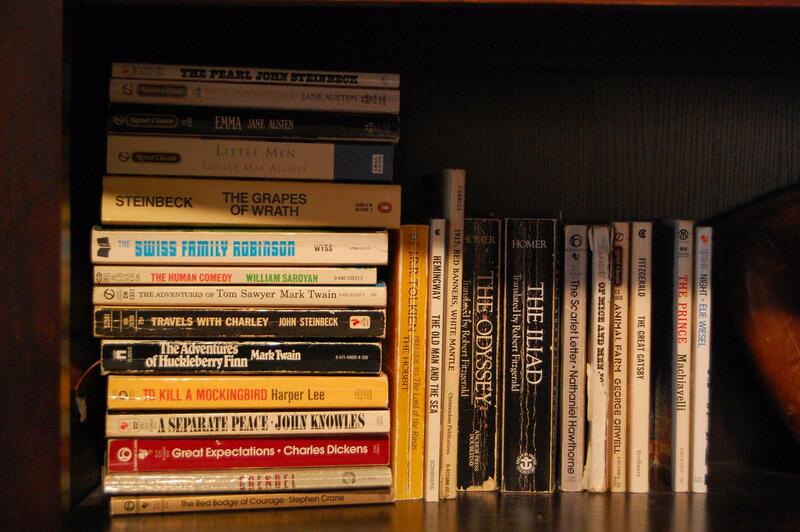 Do you have a “classics” shelf? Or a favorite tattered copy of a classic you just can’t bear to part with? I still have the copy of "Siddhartha" by Hermann Hesse from high school and I had to re-buy "To Kill A Mockingbird" by Harper Lee because the pages were all loose and falling out. I've read most of the books you have on your "classics" shelf and some were my favorite. I have all of the books I read in high school. The pages are faded and brittle in some cases (I bought some of mine from a used bookstore at the time), but I will always keep them with me. And most have notes written on the pages from where I was trying to figure out the dreaded "symbolism" of the book :) Of all of the ones I have, "East of Eden" and "MacBeth" are my favorites. I've never read Siddartha, Dru. Was it good? I'm thinking I need to brush up on my classics--because, you know, I don't have enough books to read already. LOL. To Kill a Mockingbird is one of my all-time favorites. Kelley, my kids' high school classes now encourage the kids to highlight passages and write in margins instead of just taking notes. My kids don't--I've trained them well--but it just pains me to see books that are written in--especially using ink. LOL on the symbolism. That and themes. Oh, so glad I'm not in school anymore. I am a total Charles Dickens weirdo; I like some of his "less famous" ones, especially DOMBEY AND SON. It is tender, funny and worth the effort. I have stolen some of my father's tattered copies of classics, like CATCH-22, and a few by E.L. Doctorow. Most of the classics, though, I've re-bought for myself and sometimes multiple times if I liked the different covers. (I know, obsessive and weird). Dave, I love you snitching your dad's books. Too funny. My daughter loves Dickens, too. And she informed me after reading this post that Rebecca is not going to be leaving her room--because she has her own classics shelf--how great is that? What's funny is that she has a lot of classics we don't--like Dracula and Fahrenheit 451 and lots of Shakespeare. So, looks like I need to go shopping. Heather, I liked Siddharta because it was different from the other books we were reading and it stayed with me once we moved onto the next book. Yes, it was good. Some of my personal classics: To Kill a Mockingbird, Little Women, Cheaper by the Dozen, Gone With the Wind, The Hiding Place, Diary of Anne Frank, Shepard of the Hills, Papa's Wife. I've got so many good ones it's hard to stop! I can't get rid of books, so of course I have most of my high school books. And the ones I acquired in college. And after. Plus my husband's books. A few years ago we built a full wall of bookcases (which of course are over-filled now) to house our fiction. One-quarter (on the left-hand side) are classics, one-quarter women's fiction/romance, and half mystery. The sci-fi collection has taken up residence in my daughter's room. Catcher in the Rye? Of course. My mother's original copy from the 1960s, red cover. I think my daughter borrowed it. To Kill A Mockingbird was my fav in high school. I think I'll read it again.....things are so much clearer as a grown-up. Classics shelf? Try a classics wall. For much of my life, I was a book snob. If it wasn't at least 50years old and a classic, I didn't read it. I haunted used book stores and filled my world with Dickens, Nabokov, Cather, etc. I also had ancient genre stuff, like C.S. Forrester and Edgar Rice Burroughs. Every time my teenager presents his reading list for the school year, we check our shelves first. We don't have to shop for about 80 percent of his books. When I was in high school, the books were loaned to us, so we weren't allowed to keep them. Though, I would have loved to have kept several of them. "To Kill a Mockingbird" was my favorite one. I wish I could have bookshelves built into the walls of our house, but my hubby won't let me. I'd be in pure heaven and wouldn't want to leave home. I've seriously thought about buying several classics just so that I have them. I do have a copy of "Anne of Green Gables". I loved that book! Oh, yes. I have Rebecca - actually several different copies - To Kill a Mockingbird, several P. G. Wodehouse books. My bookshelves in the front hall and the livingroom are dedicated to classic mysteries and fiction. Most of them are old copies either dragged around forever or purchased because of their age and memories. of Shakespeare, H. G. Wells, and Jane Austen. He's beginning his own "classics" shelf. Yes we do! And it contains several of the books you mentioned and has come in hand more than once for kids school issues! That's a neat idea as those are books that you don't mind re-reading. Maybe it's not a classic (or is?) but I just picked up a hardbound copy of Dracula. I often reread it. Also have Gone with the Wind. I'd like to reread HG Wells. I have reread Grapes of Wrath periodically. Some books never go out of date. We have a whole bookcase full of classics, his and mine. Rural View, I wonder if there has been any essays written comparing/contrasting Shakespeare and Twain. I bet there has! Seems like there are essays on *everything*. Hi Gayle--a whole wall is impressive! Unfortunately, there lots of HS classes that require new books from a certain publisher. Strange, isn't it? Valerie, my office has store bought shelves that have a built-in look. I love them, and hardly any work to put together (did it myself). I think my daughter has Anne of Green Gables around here somewhere, too. An early favorite of hers. Mare, you raised your son right! And with all the reading you do, I can only imagine the stacks of books you have! Julia, don't you love when you don't have to make a late night run? Usually, for us, it's for posterboard. Now I keep a supply in the house at all times. Chris, I think Dracula is a classic. And I've actually never read Gone with the Wind. I know, I know. I need to! JB, we have some notes neither of us can decipher. So funny. Hard to believe they made sense at one point. Do you save all your signed books? That's a problem I'm wrestling with now. Marlyn, do your reread them often? I hate to say it, but ours collect a lot of dust. Except when the kids need them for school! Oooh, Andrea, Charlotte's Web. Sigh. Love that one! Definitely a classic. I have to say I LOVED Sidhartha as well. I need to buy it. lol My favorites are Anne of Green Gables, need to get a new copy. lol As well as I want to get the whole Laura Ingalls Wilder Series for my oldest. I got it when I was 7 years old. So one more year. :) Little House in the Big Woods is falling apart. The bookcase in my bedroom contain the classics and some other series. The bookcase in the the guest room has children's books on the bottom shelf, young adult on the middle shelf and adult on the upper shelf. There is also a bookcase in the guest room closet that is all the rest of our children's books including some of those classics. The TBR is a 3' long by 1' wide library style side table that has a top shelf, a middle rack style shelf and a bottom shelf. These 3 shelves are all double packed and don't include the TBRs standing in the piles on the floor next to it. I love this, Heather.There are about five thousand books in our house. We both think everything we read and enjoy is a classic. That's why I first fell for my hubby: a little guy with a great big bookcase! or even where I got it?? but I loved it as a girl. Krista, because of you and Dru, I now must get a copy of this Sidhartha. It's going at the top of my list. The Little House books are classics, too. I actually get to use one in my next book, Deeply, Desperately. It's brief, but it was nice to slip it in there. Vicki, there are SO many children's classics, aren't there? There are so many of my kids' books I couldn't bear to part with (including Charlotte's Web, Trumpet Swan, etc!). And I love that kids still love the Little House books. They're really timeless, aren't they? Bella, what a sweet boy! My son just finished The Great Gatsby and it's been fun seeing him experience such a great book. you might disown me, but I haven't really read any of the classics (blame my mother, she didn't make me for high school) :( Its on my list of things to do after nursing school. I did read the Count of Monte Cristo though and loved that. I do love all the Little House on the Prairie books. 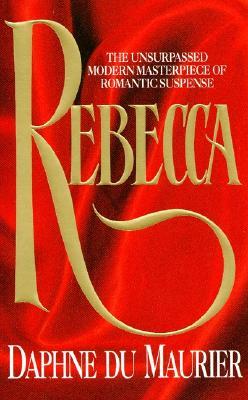 Rebecca is my favorite book ( and movie) of all time. I have read the book countless times and still get a thrill when I think of the opening line.."Last night I dreamed I went to Manderley again.."
When I decided to rearrange the titles in my bookcases, I decided to create a classics section. Some books I've moved to my bedroom, but if they were all together it would fill a shelf and half of a second one. Your bookshelf photo looks so neat. There's even room on it! That does it! I'm organizing the book wall in the living room, the shelves in my office, two in the bedroom, even the one in the workshop. Maybe then I can answer your question.